After a long battle with cancer, Levon Helm, drummer and singer for The Band, died today. He was 71. The Band had all the right in the world to carry such a simple name, as quite simply there is no other band like them. Unfortunately, I know less of the inner workings of music than I do of television and film. But when I like music, I just get that inescapable feeling. Of the short playlist of songs the classic rock station I listened to growing up played over and over, “The Weight” is the only one I never tired of. Imagine my surprise when I finally saw “Easy Rider” and heard this song playing as Hopper and Fonda rode choppers through the American West. Every time I heard that song soon after, I saw desserts and red rocky formations. I saw a chunk of America right there within its verses. The Band were the main subject of another iconic movie: Martin Scorsese’s rock documentary “The Last Waltz,” which documented The Band’s last concert. Helm has been a huge part of both my film and music education. 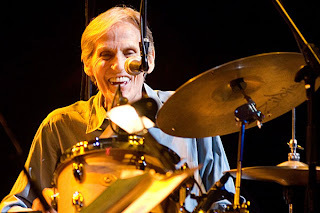 We will never have a band quite like The Band again, nor a musician quite like Levon Helm. This entry was posted in Easy Rider, Levon Helm, Martin Scorsese, Obituary, The Band, The Last Waltz on April 19, 2012 by ian0592.